Some dyes are either acidic or basic. The colored ion of the dye is called the ​chromophore. If the chromophore is the positively charged ion, the stain is classified as a basic dye; if the negative ion is the chromophore, the stain is considered an acidic dye. In a solution that has a pH = 7, there is an equal number of H+ and OH- in the solution. This means that the H+ and OH- ions will combine to simply form H20, which is water. This is a "neutral" solution. In a solution that has a pH = 1, there is a lot more H+ than OH- in the solution. Therefore, this solution has a lot of positive charges. A solution with a lot of positive charges like this, will be an "acidic" solution. If the chromophore is acidic, it is positively charged. A positively charged ion will be attracted to negatively charged ions (anions). So a stain with positively charged chromophores WILL STAIN BASIC/NEGATIVELY-CHARGED SUBSTANCES.... This is why it would be called a BASIC DYE, and not an ACIDIC DYE. In a solution that has a pH = 14, there is a lot more OH- than H+ in the solution. Therefore, this solution has a lot of negative charges. A solution with a lot of negative charges like this, will be an "basic" solution. If the chromophore is basic, it is negatively charged. A negatively charged ion will be attracted to positively charged ions (cations). So a stain with negative charged chromophores WILL STAIN ACIDIC/POSITIVELY-CHARGED SUBSTANCES.... This is why it would be called an ACIDIC DYE. ​Acid-fast mycobacteria will appear as dark pink to red bacilli against a blue background when examined microscopically. STEP TWO = PRIMARY STAIN STEP. In this step, the primary stain, Carbol Fuchsin, is applied to the cells and heated. Carbol fuchsin is a mixture of phenol and basic fuchsin. , used in bacterial staining procedures. STEP THREE = MORDANT STEP. A "mordant" is a substance used in staining or dying procedures that "sets" or "binds" the stain to the structure being stained. When a mordant is used, the stain is more resistant to being washed off. In the Acid-Fast stain, HEAT is used as the mordant to help Carbol Fuschin bind more strongly to peptidoglycan. STEP FOUR = THE DECOLORIZATION STEP. 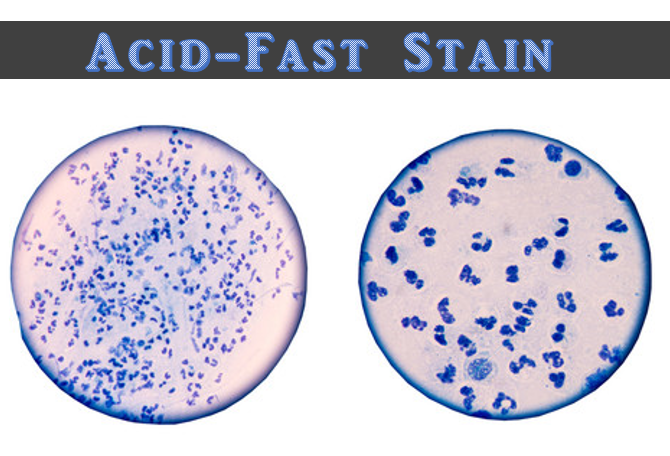 In the Acid-Fast stain, Acid Alcohol is used to "decolorize" the cells. In this step some of the Carbol Fuchin is removed from the peptidoglycan layer. 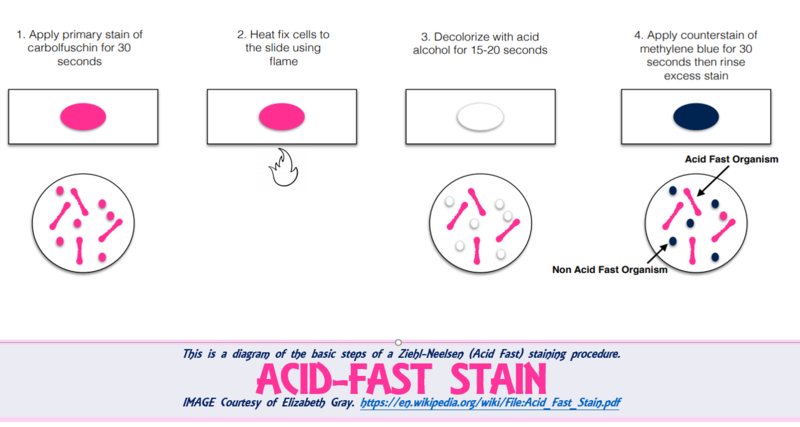 This step is the most important step in the Acid-Fast stain procedure. It is critical to leave the slides exposed to the decolorizer (alcohol) long enough to remove the Carbol Fuchin stain from non-Acid-Fast bacteria cells, but not so long that it removes all of the Carbol Fuchin from the Acid-Fast bacteria cells. Exposure to the decolorizing alcohol for either too little time or too much time, will give you false results! 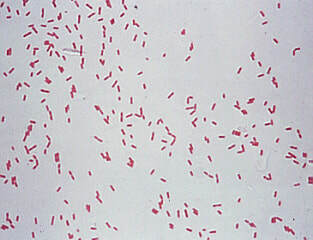 Non-Acid-Fast bacteria should loose their red/pink color from the Carbol Fuchin primary stain during this decolorization step. Acid-Fast bacteria should be able to retain their reddish-pink color from the Carbol Fuchin primary stain following decolorization. STEP FIVE = THE COUNTERSTAINING STEP. The counterstain to uses is called, Methylene Blue and it stains bacteria cells blue. However, for cells that have picked up the pinkish-red color of the Carbol Fuchin, the pinkish red color will dominate over the blue counterstain, provided the counterstain is not kept on the slide too long. What is the most important step of the Acid-Fast procedure? The decolorizer step is the most important part of the Acid-Fast stain procedure! Why is the decolorization step the most important step of the Acid-Fast procedure? Because if it is done for too long, a Acid-Fast cell can LOOK like a non-Acid-Fast cell! If you do not decolorize long enough, then a non-Acid-Fast cell can LOOK like an Acid-Fast cell. The idea is to keep the slide in the decolorizer long enough to remove the Carbol Fuchin stain from the non Acid-Fast bacteria cells, but not so long that it removes all of the Carbol Fuchin from Acid-Fast bacteria cells. 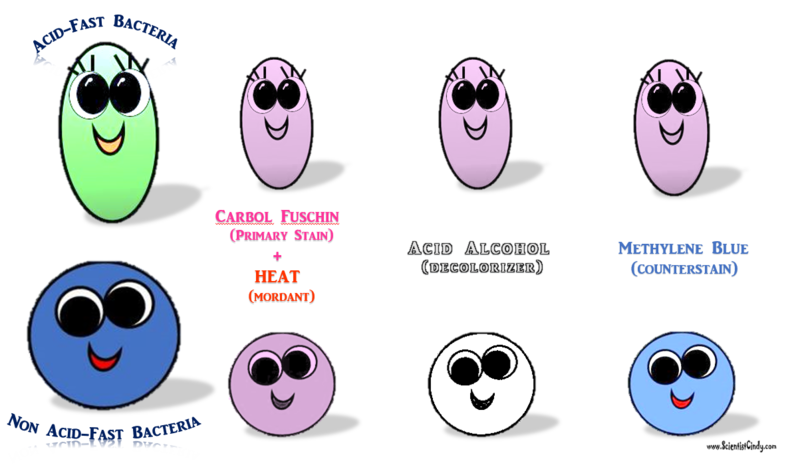 Pseudomonas aeruginosa is a Gram-negative rod measuring 0.5 to 0.8 µm by 1.5 to 3.0 µm.